+PlusShake is an advanced whey protein powder from grass-fed cows. Our blend is designed to provide 27g of protein and a complex of 100% whole foods, multi vitamins and minerals for optimum energy, superior well-being and peak performance. 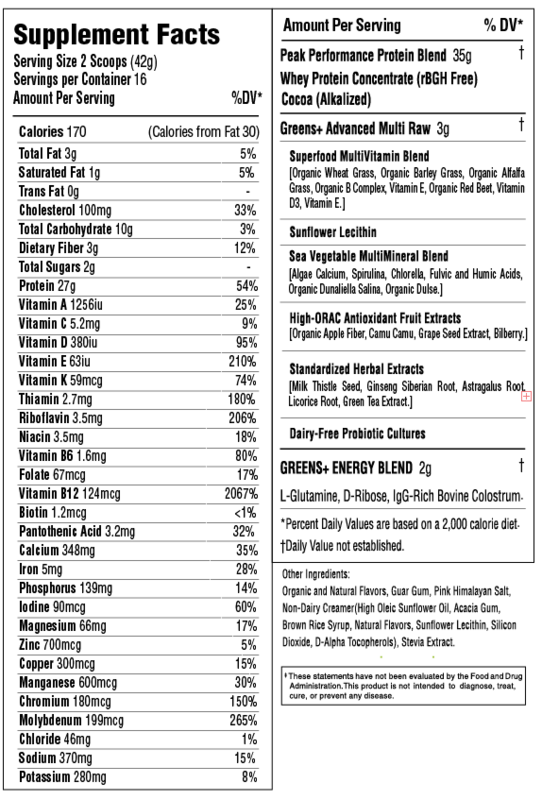 +PlusShake was designed to meet all of your nutritional needs. Use as a meal replacement, pre/post workout or in a delicious smoothie. Directions: Mix 2 scoops of +PlusShake in 12oz of cold water or your favorite beverage. For a thick, creamy shake use less water. +PlusShake can also be mixed with almond milk or your favorite smoothie recipe. Find delicious recipes here. Other Ingredients: Organic and Natural Flavors, Guar Gum, Pink Himalayan Salt, Non-Dairy Creamer (High Oleic Sunflower Oil, Acacia Gum, Brown Rice Syrup, Natural Flavors, Sunflower Lecithin, Silicon Dioxide, D-Alpha Tocopherols), Stevia Extract.